Under the Clive Steps beneath the Treasury buildings in Whitehall are the “Churchill War Rooms”, the underground complex where Prime Minister Winston Churchill centered his administration during World War II from 1940 to the 1945 surrender of Japan. It was sealed up until the 1980’s when it came to the attention of a Member of Parliment who insisted that the rooms be opened to the public. 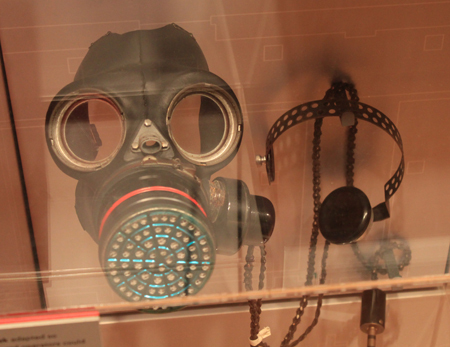 A gas mask with communications modifications so that the government could continue to function even in the direst of circumstances. 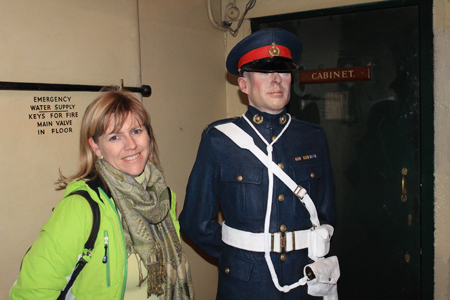 The original rooms are now part of a museum with the original furnishings arranged as they were during the war. The map room even has the map with the original pin holes showing the troop movements throughout the war. 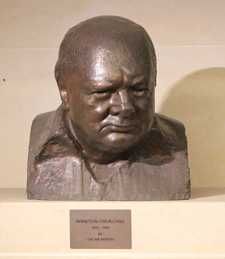 The remainder of rooms have been turned into an exhibit about Churchill’s life from birth to death. After a long day soaking in all the sights, we bailed on the museum before we saw even half of it. It deserved much more time and attention than we had to give. Sometimes you just have to move on.